How do I use Miracle Teeth Whitener™? Using a soft bristle toothbrush, dampen the bristles with water then dip the brush into the powder. Brush your teeth gently for 1-2 minutes. Rinse thoroughly. For best results, use just before your regular brushing and flossing routine, twice daily. What are the ingredients of Miracle Teeth Whitener™? Activated Coconut Charcoal, Sodium Bicarbonate, Bentonite Clay, Organic Orange Essential Oil, Organic Coconut Oil, Organic Peppermint Essential Oil. No, Miracle Teeth Whitener™ is a teeth whitening product and does not replace normal toothpaste. It is recommended to use Miracle Teeth Whitener™ on real teeth. Do you have to use this with a normal toothbrush or can it be an electric toothbrush? It is recommended to use a different toothbrush from your everyday toothbrush when using Miracle Teeth Whitener™. You can use an electric toothbrush but it might scatter it around your sink area. With Miracle Teeth Whitener™ you can start seeing results after the first use! 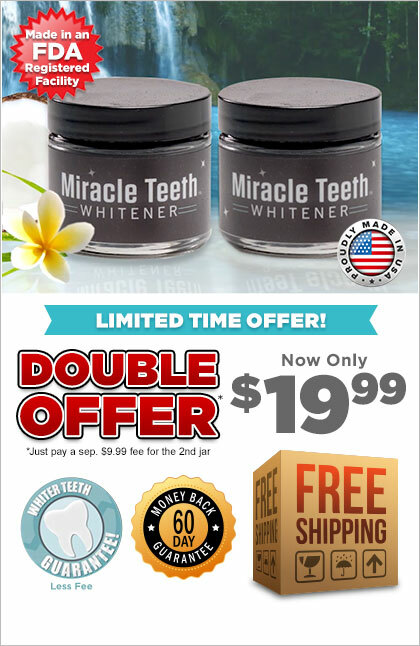 How long does each jar or Miracle Teeth Whitener™ last? Pending on how much and how often you use Miracle Teeth Whitener™ the jar will last about 3 months. Yes, Miracle Teeth Whitener™ is an all-natural product and may even help keep your gums healthy while your body is changing during pregnancy and post pregnancy.